With every PAID (at the show) opening order we will gift you 2 - 2 packs of our 5" coasters and a standard wine board. A $39 value. Forever Boards New England, LLC - "Lobster Buoy"
Our award winning Lobster Buoy is the perfect serving board. WOW your guests.....chill the board before serving a cheese plate, sushi, shrimp cocktail or fresh fruit. 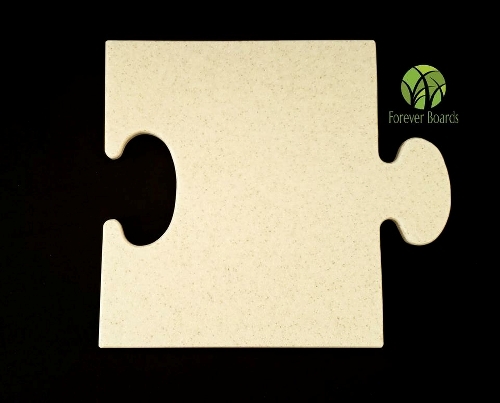 Forever Boards are uniquely handcrafted with a solid surface (I.e. Corian) that was destined for a landfill, that we reclaim and remove from the waste stream. Unlike traditional cutting boards, Forever Boards are nonporous; therefore, NO bacteria, NO cross-contamination and NO odor. 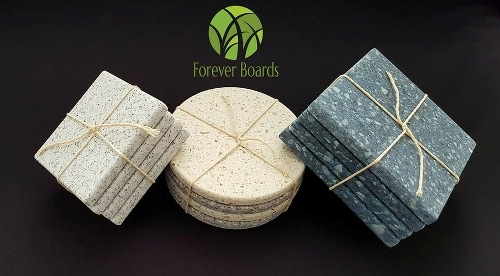 Forever Boards are dishwasher safe or may be hand-washed with hot soupy water. If an oil adheres to your board, simply use Dawn dish soap full strength, let sit approximately 30 minutes, rub with a scouring pad and wash as usual. Because Forever Boards are “softer” than a knife blade it is the ideal surface for your knives. 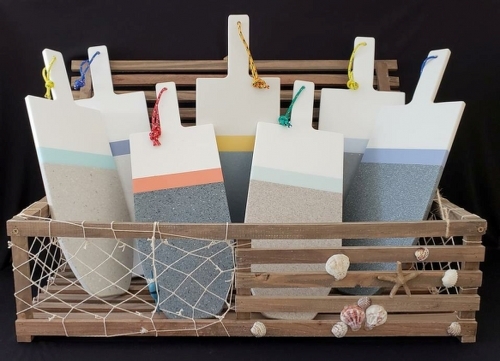 You may use an 60 grit sandpaper and an orbital sander to refresh the workable surface over and over again, the color and pattern will remain the same! 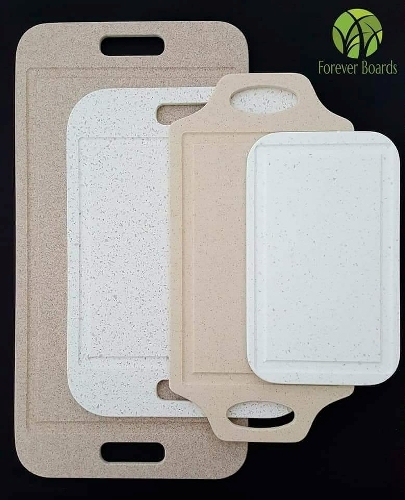 Chilling Forever Boards before serving cold food items (cheese, fruit, sushi, shrimp, etc) will keep your food cold and fresh. Forever Boards may be used as a beautiful trivet for items up to 400F (excluding cast iron pots and pans). A Forever Board is NOT a cooking stone. Do NOT place in any type of oven. 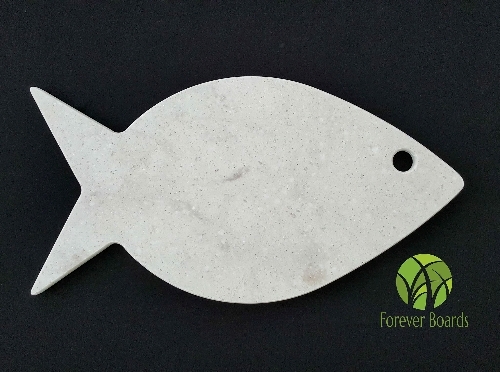 Forever Boards New England, LLC - "Poisson"
The Poisson (Fish) is the perfect cutting board for any lake and/or ocean home. Stylish in it's design for a décor item but practical use as a traditional cutting board & serving board. What better way to serve a Thanksgiving turkey, Easter ham, your latest smoke BBQ creation or a fresh fruit for Sunday brunch but on our Carving Trays! 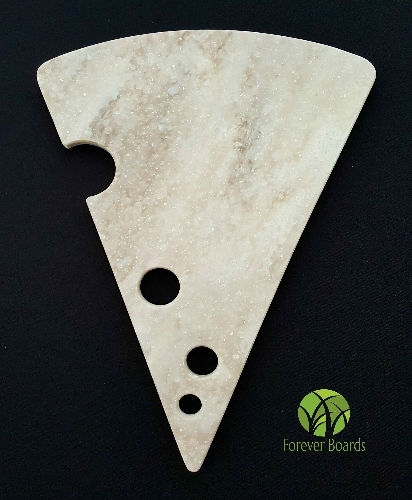 Forever Boards New England, LLC - "Swiss Cheese"
The Swiss Cheese is the perfect board to cut & serve 1 block of cheese! Makes a great addition to any gift basket, as housewarming gift or that company gift exchange. The Puzzle Piece is a brand new design for 2019!